Exercise and the Brain – Physical activity is not only good for the body, it's also good for your brain. A little movement may make one feel sharper – and increased physical activity can even have a measurable impact on students' reading and math grades. Get outside and get active! – Recent studies show that when children are exposed to nature and the outdoors they are happier, have more energy and are less anxious. Getting active after school – The after-school period is often a sedentary time for kids, as their parents may tend to keep them indoors in a safe place instead of running around outside. 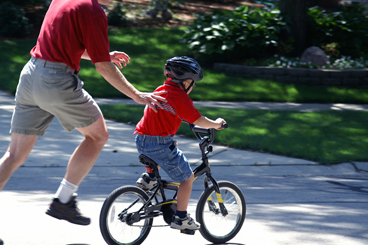 An active child should be getting physical activity at home, at school and in the community. And there are plenty of ways that you can encourage your kids to get more physical activity into the hours after school. How can I stick to my resolutions to lose weight and be more active? Tips on Getting Active and Recreation Organizations – Less than half of all Manitobans get enough physical activity to improve health. Here are some tips to help you keep moving. When is My Child Ready for Sports – Use this table that matches your child's skill development with those needed for common organized sports and activities.